SAPIEN Women Leave-In Conditioner is made with antural, organic and vegan Amazonian Ucuuba and Murumuru butters, Pracaxi, Macadamia and Buriti oil as well as Amaranth Protein and Vitamin E. All of these work together to hydrate, condition and impart health and shine to the hair. Hair will look and feel healthier, softer, and be shinier. It will be so much more than you had ever hoped for. You will love the fresh coconut and mango scent. To use, apply to damp hair and dry hair and style as usual. I love this leave-in conditioner more than any other I have ever tried. It actually leaves my hair feeling soft, shiny and better than ever. Surya Brasil hair care uses only the best ingredients from the Amazon. Their hair care is some of the best all natural hair care on on the market today. 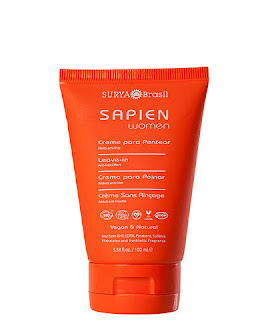 Surya Brasil SAPIEN Women Leave-In Conditioner is currently on sale for $8.35. It can be found online at www.suryabrasilproducts.com. Like Surya Brasil on Facebook: https://www.facebook.com/suryabrasil; Follow Surya Brasil on Twitter: @suryabrasil; Follow Surya Brasil on Pinterest: https://www.pinterest.com/suryabrasil/; Follow Surya Brasil on Instagram: https://www.instagram.com/suryabrasilbeauty/ and Subscribe to Surya Brasil on YouTube: https://www.youtube.com/user/suryabrasil.